In 1983, Honda uncorked a one-two punch that rocked motorcycling's world. The two motorcycles could hardly have been more polar opposites, but each showcased Honda's unique engineering talents, brought to bear on two completely different market segments. One was the VF750F Interceptor, which flat-out redefined the limits of sportbike performance. 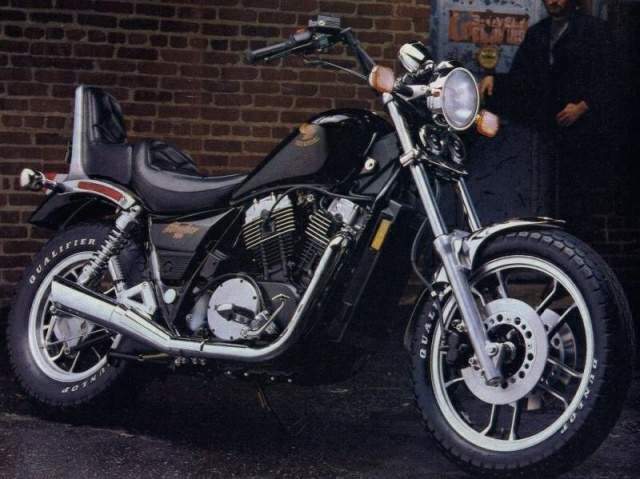 The other was the Shadow 750 (VT750C), a motorcycle that changed the perception of V-twin custom cruisers. Why? Because as a purpose-built cruiser, the Shadow 750 not only made powerful statements about styling, but it also established innovative standards for high-performance, low maintenance and forward-thinking engineering. Other noteworthy examples of engineering include the bike's Sprague (one-way) clutch that allowed the clutch to slip slightly when the bike was downshifted at high revs, thereby eliminating the wheel chatter that plagued other big twins. The Shadow 750 also saw the debut of three-valve, twin-plug cylinder heads, a feature you'll find on present-day Shadows. Three-valve heads flow better than a comparable two-valve head, while the twin plugs reduce emissions, increase fuel mileage and quicken the burn for resistance to detonation. Liquid cooling further contributed to lower emissions and more consistent performance, due to more stable engine temperature. Another benefit of all this advanced technology was performance. The Shadow offered acceleration that could best motorcycles with half again more displacement. But that's not all. The Shadow positively bristled with touches that reduced maintenance. Hydraulic valve adjusters, electronic ignition, cam chain tensioners, hydraulically actuated clutch and front brakes, a brushless generator and shaft final drive all contributed to make the Shadow 750 easy to live with. As Cycle magazine said in its test of the Shadow, "Only the spark plugs, engine oil and filters require attention; no motorcycle has ever offered such hassle-free ownership." It was a boon to those who wanted to ride, not tinker. Perhaps the most radical thing about the Shadow, though, was its appearance. Other Japanese manufacturers had cautiously approached the classic American cruiser style popularized in the choppers of the '50s and '60s by adding new bits and pieces to their standard models, but the Shadow was the first to design and incorporate all the styling cues into one bike as a fully integrated cruiser. The Shadow had all the right touches: V-engine, teardrop gas tank, two-piece seat with sissybar and backrest, cast wheels, pullback handlebar, raked-out front end and angle-cut muffler. It was a cruiser that stormed the boulevard by way of the drawing board. The Shadow 750 established Honda at the forefront of a cruiser movement that grew to become the most popular motorcycle genre in history. As with almost all landmark Hondas, the 1983 Shadow 750's most enduring contribution is the inspiration it provided for future Shadows. Perhaps Honda's 1983 Model Guide said it best: "The Shadow 750 combines the styling and emotional appeal of a traditional custom V-twin, with exciting technological innovations that make it superior to any other V-twin motorcycle." Just like today's Honda Shadows.